Purchase your copy of the 2015 LGBTQ Policy Journal today! Progress: nationwide marriage equality; transgender military service; boy scouts poised to allow gay troop leaders. These victories are the culmination of decades of organizing, education initiatives, campaigns, lobbying, litigation, and much more. Nationwide marriage equality was a dream that appeared out of sight even just a few years ago. But the courageous acts of individuals and groups have lead to a social movement that is making progress for LGBTQ people around the nation. Yet for all we have accomplished, much work remains. At home and abroad, too many LGBTQ individuals lack basic protections against discrimination, leaving them disproportionately affected by poverty and violence. In the United States, the beginning of 2015 saw an unprecedented number of reported LGBTQ—14 victims by April, half of whom were transgender women of color. Too many LGBTQ Americans lack basic protections against discrimination in employment and housing, meaning they can legally be fired or denied housing on the basis of their sexual orientation or gender identity. On the global stage, the 11th Annual International Day Against Homophobia and Transphobia (IDAHOT) was celebrated by grassroots organizations and civil society groups in 128 countries and on every continent. A group of experts and United Nations agencies released a joint statement about the urgent need for protection of LGBT and intersex youth. This momentum locally and internationally is met with the reality that laws exist in 79 countries that criminalize sexual behavior, gender expression, and dissemination of information about LGBTQ topics. If there were ever a time for innovative policy solutions to some of the biggest human rights challenges facing LGBTQ people, that time is now. The burst of global energy and increased funding for LGBTQ rights initiatives is unprecedented. It is at this exciting moment and in this unique context that we are proud to announce the release of the 2015 LGBTQ Policy Journal at the Harvard Kennedy School. Many of these selected articles touch upon some of the challenges mentioned above, while others could very well portend the next strategic issue in LGBTQ policy making. We hope that these 11 articles will offer new perspectives on the road ahead to ensure that LGBTQ people can live their lives to the fullest. 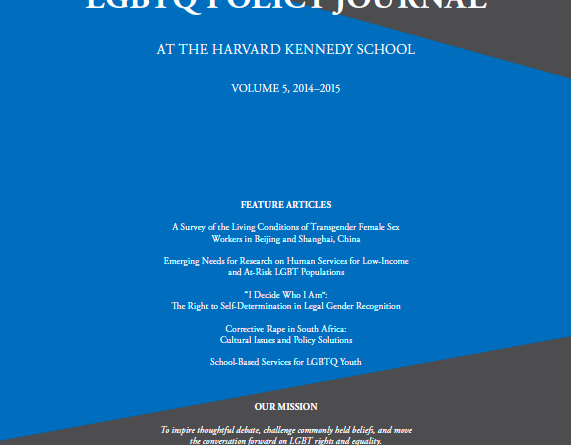 Support LGBTQ research and purchase your copy of the 2015 LGBTQ Policy Journal at the Harvard Kennedy School here!